OK I admit it, it has been a long time coming. But eventually, after various technical problems and other delays I am really pleased to say that Volume 3 in the Inpirational Journeys series of guided meditations is now released. As with Volume 1 it features 2 CDs. 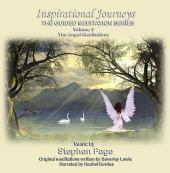 The first has two Angel meditations written by Angel expert Beverley Lewis and narrated by Rachel Bowles and the second CD has just the music that I composed for the meditations. Visit the Aquavision Music site for more details and to buy. Volume 2 has also been released. 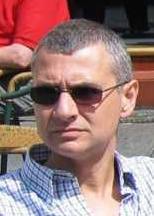 The music for that one has been produced by Simon Cunliffe. Up until the end of August 2008 Aquavision are doing a special offer where if you buy a copy of Volume 2 and 3 you'll get a copy of Volume 1 free of charge so worth checking out. I have been desperately trying to get a new site designed but time just is not on my side and hence why the updates have also been few and far between. It is something I am acutely aware of and hope to be in a position to work on it in the near future. Fingers crossed ! ! ! I am really delighted to announce that an album by Medwyn Goodall & Terry Oldfield entitled "OM" has been released and features a guest appearance from yours truly! As most of you know Medwyn has his own label, MG Music, and he came up with an ambitious project whereby he invited other artists on his label to produce a backing track of what OM meant to them, then, Medwyn would add guitar and Terry would add flute to those tracks. The result would be an album of OM. Although I am not technically an artist on the label Medwyn kindly invited me to participate in the project as well. I submitted 2 tracks for consideration and was delighted when he confirmed that one of them had been selected. They had about 2 hours worth of material submitted by all the artists and so about half of it could not be included leaving about a 60 minute album. 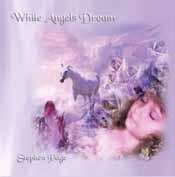 While Angels Dream - The New album ! Please note that the streaming realmedia samples are best suited for those visitors with dial up 56k connections. The streaming mp3 is best suited for those with broadband connections. I am delighted to announce that the new album is all but finished. Just a little tweaking here and there but that's it ! The style of the music is similar to Dolphin Ascension so if you liked that album then I know you will love this one. It is my best album yet, even if I do say so myself. I am also really thrilled to announce that the album features a guest appearance from Medwyn Goodall..
Medwyn has guested on "Awakening" and plays Spanish and electric guuitars &, tabla. I have been a fan of his music since long before I was a professional musician so to have him guesting on my album is a real honour and privelage. Medwyn is responsible for such classic albums as 'Medicine Woman', 'Druid', 'Clan', 'Excalibur', 'Comet' and 'Millennium' to name but a few. The artwork throughout the album was created by an incredible artist, Sara Perry. I first met Sara at a trade show in Brighton. During a break in performing I was wandering around the show and as I passed Sara's stand I was immediately grabbed by the colour and depth of her artwork and after talking with her for only a short period of time I knew that she was just the person I was looking for to create the images for the new album. To say that the artwork throughout is breathtaking is a complete understatement and you will see what I mean when you see the album for yourself. As an artist it is always nice to see reviews of your albums appear in publications, especially highly respected ones. The trade magazine "Massage World" has just published a review of "Inspirational Journeys" which you can read in full on the Reviews page. Also just published is the December 2004 issue of the excellent "Prediction" magazine and they too have included an amazingly positive review of the CD. In fact the reviewer, who is the editor of the magazine, had a really profound experience with the water meditation which had a really positive effect on her. Read the full review on the reviews page. 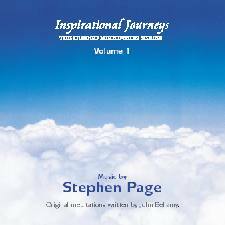 I am delighted to announce that my new album "Inspirational Journeys - Volume 1" is now available to purchase. This album is the first in a series of Guided Meditation CDs being released on the Aquavision Music label. It's being released as a double CD with CD1 containing the meditations and CD2 containing just the music used as background to the meditations. There are 2 meditations, "The Water Meditation" and "The Earth Meditation". I am also delighted that John Bellamy, the owner of the spiritual retreat in Bournemouth, Dorset "Hamilton Hall" wrote the original meditations for this album. I was fortunate to be put in touch with John about a year ago and is a really wonderful person. He runs a wonderful retreat and during the autumn and winter months has a lot of weekend events so it is definitely worth checking out his web site for more details and having spent weekends there myself I can personally highly recommend it. It's great if you just want somewhere to chill out and get away from everything for a while, or, go on one of the weekend events where you are bound to meet and mix with some other likeminded people. Checkout www.hamiltonhall.info for more details. If you do go and visit make sure you sit down with John for a chat on spirituality and things associated with it. He is mind of information and a great person to talk with. The meditations were narrated by Tony who has this beautiful soft Edinburgh accent which is in itself so calming and relaxing and was the ideal choice to record these meditations. I am definitely looking forward to recording another volume in this series. The release of this album does mean though that "While Angels Dream" the long awaited follow up to "Dolphin Ascension" will now be held back probably until Spring next year. Also next year I am hoping to have released another 2 CDs in the "Inspirational Journeys" series and will be inviting other people to write meditations for these and I shall be writing some myself too.